It had just gone 8am and we were in the car ready to go. In MY car as Sarah's car battery had given up the ghost the weekend before. Sarah started at 10am and we had a whole 25 minutes drive ahead of us. In my opinion, leaving 2 hours for this journey didn't make a whole lot of sense but then again opinions are like assholes; everyone has one. We reached the site about at about 8.30am (before registration had even opened) and Sarah went straight to the portaloos. It had been a good while since Sarah's last running event and so she had clearly been missing the aroma of a temporary plastic toilet. Obviously one trip was not enough for her to get her fix as she visited 2 more times within the next hour. Next she would be jumping behind hedges, toilet paper in hand, just for nostalgic reasons. 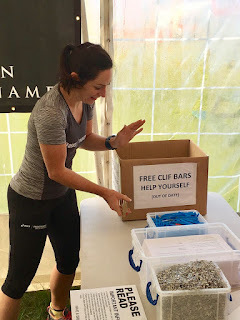 After registration Sarah took to preparing herself and her kit for the challenge ahead. 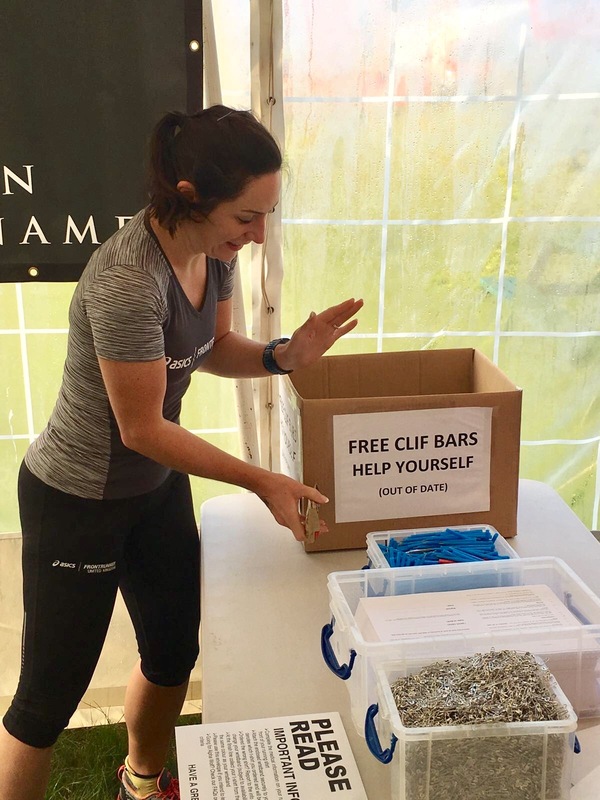 This included using 6 safety pins to secure her number to her top and the acquirement of some out of date Cliff Bars (linked to toilet trips?). Now ready and armed with coffee we ensured enough 'before' pictures were taken. I am not known for my ability to take a good photo so have learned that I need to be taking at least ten shots in each pose to ensure a usable one is created. One of the benefits of being onsite early is having the opportunity to observe the other runners. 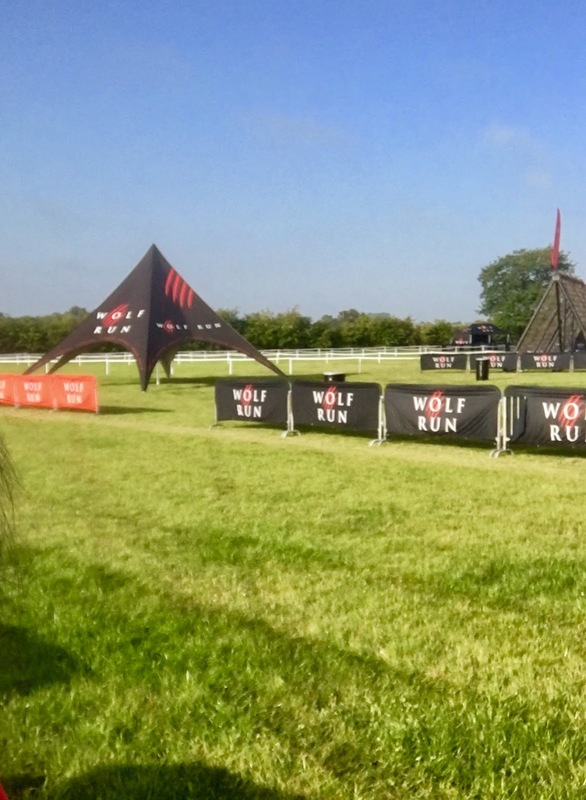 I love looking at competitors at events like the Wolf Run as there is such a wonderful diversity of people. 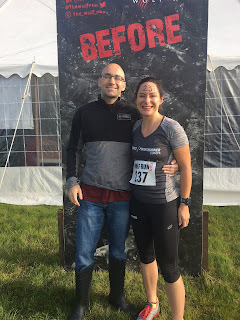 From those that are typical runners (skinny, hungry looking, club vests ...), to the gym rats who have entered because they want to try something that's described as an 'extreme' event, through to the people who are nervously toeing the line for their first event and already dressed in the event's t-shirt. These kind of events are not judged on speed but on ability to complete and capacity to enjoy. One lady in particular stood out. Clearly in the 'runner' category and taking the event very seriously (stretching and stuff) with a very focused look on her face (or possibly needing a poo but not interested in visiting the portaloo). I though that if she isn't good she's going to look silly. Eventually Sarah was called up for the official warm up and the start was at T minus 10 minutes. 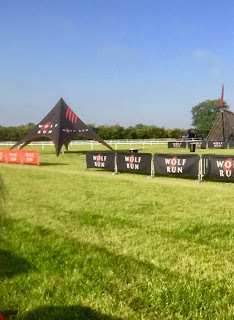 After a few minutes of shouting from the 'motivators' and some running and crawling around in circles: actually this was a more useful warm up than I make it sound but it was still making me dizzy. Obviously I couldn't watch Sarah around the course but it was easy to imagine how she was running. Fake nonchalance with a big smile on her face. That is to say, pretending she wasn't competitive while picking off runner after runner and loving every minute of it. I sometimes wonder how far Sarah's drive would take her. 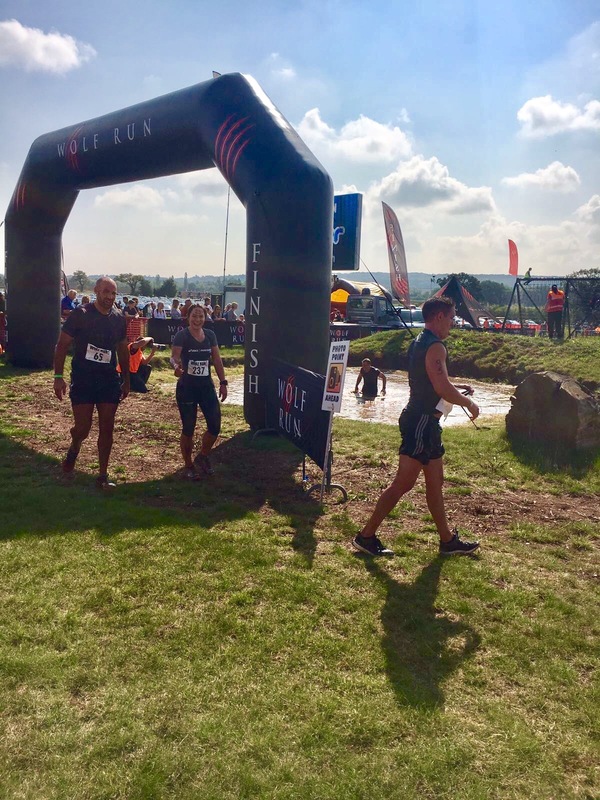 Any given situation could turn into a example of a popular adult card game – 'Sarah against Humanity': “While running an obstacle course Sarah would...”. While waiting for her I spied a couple of friends who were aiming for the title of Alpha Wolf – Marina and Aurian. As we caught up and talked about next years plans around running events Marina pulled a 'Sarah' by visiting the portaloos twice; she had obviously missed the aroma too. Their starting wave was about 90 minutes after Sarah's kick off time and had suggested meeting up with Sarah after she had finished but before they started. Sarah had pooh-poohed this idea stating she would take closer to 2 hours to finish the course. Having completed the run a couple of years earlier in just over 1 hour she was fooling no one and we were keeping an eye out from the 60 minute mark. It was not long after his that the first lady came through to tackle the last obstacle and finish. It was the focused, fully prepared, possibly constipated lady we had seen before the the race had started, she definitely wasn't looking silly! It was only about 5 minutes later than Sarah came into sight on the last straight. 2nd woman! As I said competitiveness masked by a pretence of blasé. She had picked up a running buddy and they had clearly been pushing each other in that friendly 'you're not going to beat me' kind of way. Sarah has always been fantastic at this – chatting to everyone and picking up buddies during every race she enters. (Sometimes she doesn't even drop them with a mile to go in pursuit of a good time or place!). As the two of them climbed over the last obstacle it looked like that Sarah wasn't keen to fly off and beat her companion ... while at the same time not wanting to be beaten by a last minute sprint by her buddy. 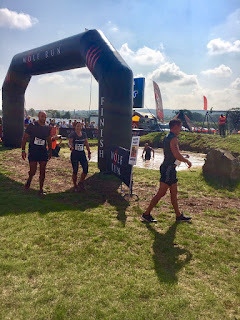 She cleverly overcame this by taking her time composing herself for the final leap into the watery mud that signified the end of the course ensuring the best race picture possible, not taking the inconsiderate 'win', while also maintaining her 'I could have beaten you if I wanted to' position. Having finished she made sure the finish line marshall received a muddy hug. Then having shown off the mud she was wearing to me, she made sure I also received a sopping wet hug. A pint of cider for her (I was taxi driver today!) and a few quick hugs for Aurian and Marina before they set off rounded off her event. And judging by her grin and the amount of mud she was wearing it had been a good one!